They say it's a dog's life. Well, we can only hope. Dogs have it good and it's not just luck, it's smarts as well. We can learn a lot from our pups. They take naps in pools of sunshine. Their timing is perfect, it's like they have superpowers. For instance, just as you're losing interest in the crust of your peanut butter and jelly all the sudden Fido's nose is right there, waiting for a scrap. It's no wonder that these soft and lovable beasts have been popular since the beginning of civilization. We kind of owe them a lot. They've kept our houses free of rodents (maybe that's why dogs and cats are so competitive). They warn us of danger, pull us across long expanses of snow and ice, and warm us up when the nights get cold. All these doggos want in return? Food scraps and belly rubs. We think that's a pretty great deal. 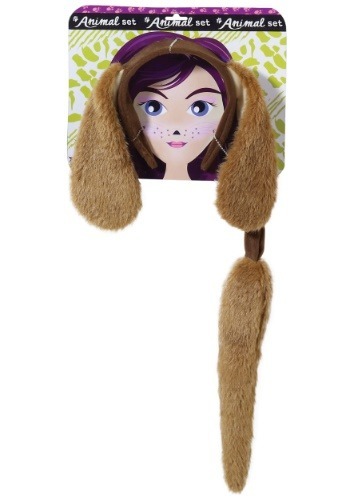 You or your child can get that canine candor in no time with this faux fur animal set. The fabric covered headband has long floppy faux fur ears and matches the fuzzy tail. Perfect for Halloween or playtime! Now, you've got the dog costume you just have to figure out how to behave as well as your own pup. Do you think you'll be able to stay off the furniture or refrain from barking at the mailman? Well, hopefully, the later inquiry won't be too much of a challenge. Who knew that enjoying the dog's life would be so much fun?